Practical insights cut across religious boundaries to convey a vibrant spirituality in plain, accessible language. “Nothing gets one’s attention like one’s imminent demise,” writes Gene O’Neil in An Upraised Chalice, a book that chronicles the remarkable travels, adventures, and out-of-body and near-death experiences that have marked his quest to discover the meaning of life. O’Neil’s practical insights, born of experience, cut across religious boundaries to convey a vibrant spirituality in plain, accessible language. O’Neil’s youthful solo journeys drew him intuitively to Jerusalem, the Himalayas, and India, places where he felt a sense of belonging, as though he were “coming home.” Each experience—whether facing death while climbing in the Himalayas, meditating inches away from a huge king cobra, or being rescued through the intervention of spiritual beings—reveals clues to his true nature and the purpose of life: reunion with the indwelling “Omnipresence of the Divine,” which he calls our individual “I Am Presence”; acquiring knowledge of the laws that govern all; and awakening to the awareness of the workings of the “Brotherhood of Light,” the “Great Ascended Masters” who he believes guide and protect him. Every person, according to O’Neil, must undertake such a journey, though he writes that, “it may not be as dramatic or challenging as some of my adventures.” Promising that one’s life will change for the better through that journey, O’Neil describes the “ever-so-sweet, intense Love” of one’s own divine presence, likening it to an “electrical charge” that has the power to enable one to live a richer, more joyful life. “The Path becomes the most Sacred and the most Real aspect of your Life,” he writes. “You become an Upraised Chalice. The Joy, the Peace, the Wisdom, and the Protection that this will afford you, your family, and your loved ones is beyond words to convey.” In language both conversational in tone and intimate in nature, he describes his exquisite experiences of ever-deepening meditative states and his growing ability to perceive the events of daily life through the lens of higher consciousness. O’Neil, who is a flight instructor, builder, teacher, and world traveler, and currently owns an Internet marketing agency in Vermont, declares that everyone’s birthright is “the self-same Love, Wisdom and Power that Jesus and so many others have wielded over earth’s long history.” His authentic, heartfelt book chronicles his discoveries and offers clear instruction on how to awaken the individual “I Am Presence” within. 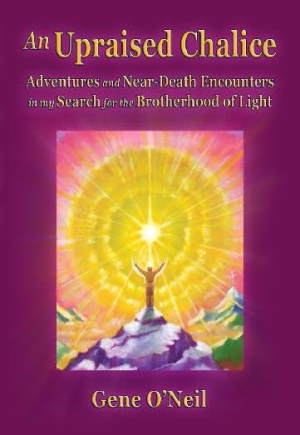 O’Neil’s compelling book offers a clear road map for both what he calls the greatest and most exciting journey one can take (the journey within) and the greatest discovery one can make (our true identity as divine love).